Melanie Rios is a permaculture teacher and Executive Director at Lost Valley Center. She is also an activist, gardener, and musician, and has lived in intentional community for 35 years. Lost Valley Educational Center avoids collapse and reinvigorates itself by applying a new approach to governance combining the best of diverse models. A permaculture teachers hits upon a gold mine of effective methods for enlivening her teaching—by drawing from the principles of permaculture itself. 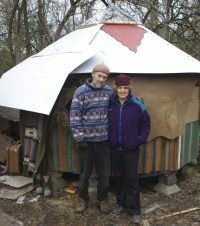 Can an ecovillage gal live for a week in a mainstream household–with a microwave oven, processed food on paper plates,five SUVs, and six tiny pedigreed show dogs–and make a difference?